Artistic talent may run in the Romero family’s blood, but it’s hard to predict which way fortune will blow at Santa Fe’s all-important Indian Market. 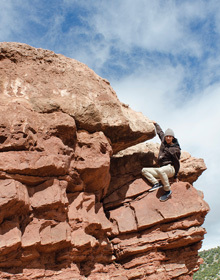 (above) The Romeros on the rocks near their ancestral Cochiti Pueblo. From left: Cara, Diego, Santiago, and Mateo. For Diego Romero, Indian Market was over before it started. After more than 20 years as a prizewinning contemporary potter, he had just one ambition left—to win Best in Show—and he’d blown his annual chance. Not that there was any shame in losing. The Southwestern Association for Indian Arts’ (SWAIA) August extravaganza is the largest Native art market in the country, and its thousand or so vendors have a dizzying range of talents, from precontact-style stone jewelry to digital graphic art. Only one piece can win Best in Show. But Diego hadn’t lost. In fact, he hadn’t even competed. 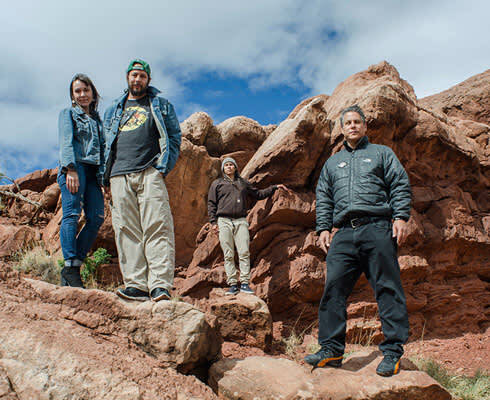 Somehow, between picking up the kids from their Santa Fe daycare, tending to ceremonial duties at Cochiti Pueblo, and all the niggling distractions that can keep an artist from his studio, he’d just miscalculated. When the judges made their pre-market rounds on Wednesday, his pot was still on a table at home, awaiting its finishing brushstrokes. Cara Romero, Diego’s wife of four years, wouldn’t have missed judging for the world. In 2013, after a decade of intermittently showing her photography at Indian Market, she had finally hit it big. Instead of submitting one of the landscapes she’d shot that year near the California Chemehuevi reservation, where she grew up—“Joshua tree country,” she calls it—Cara had found herself drawn to a family portrait she’d taken as an afterthought: Diego’s adult son Santiago standing on the center stripe of a desert road, hoisting Paris, Cara and Diego’s infant son, aloft against the sunset. The resulting panorama, Nipton Highway, was both epic and intimate. SWAIA judges awarded it Best in Division, a prize just one level below Best in Show. Now, returning to Indian Market a year after her first big success, she’d submitted a new photograph that had earned her a second consecutive Best in Division award, continuing a scintillating run heralding her as an emerging force in Native art world. It was going to be a good weekend. Viewed from above, opening day at Indian Market might resemble a great spiral galaxy spinning out from the Santa Fe Plaza. Each year thousands of turquoise-bedecked shoppers crowd the streets before sales open, clutching large coffees and puzzling over maps and booth listings. Inevitably, many gravitate to the show’s biggest stars. On Saturday morning it didn’t take long for Diego to unload his lone vessel to one of the circling collectors for a five-figure check and escape to the movies with his kids. (One-Pot Romero, a friend calls him.) Cara stayed behind in their booth with her prizewinning prints, established at last at the center of her own orbit. On the other side of the Plaza, along the galactic arm that stretches north up Lincoln Avenue, Mateo Romero was faring similarly well. Diego’s younger brother works in paint, not pottery. For Indian Market he unveiled a new style, a series of New Mexico landscapes done in thick oil impasto, which the public was snapping up along with the multimedia paintings of Native dancers for which he’s known. His canvases rotated so quickly that it was possible to wander down to the end of the street and fail to recognize his booth on the way back. 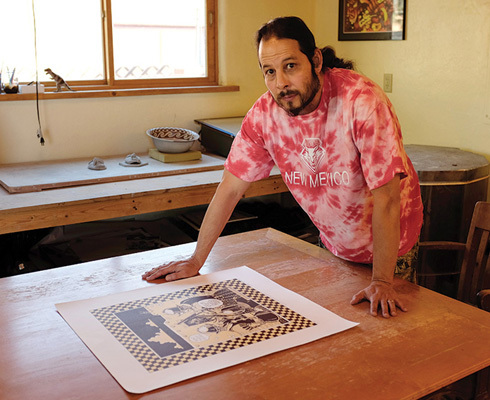 By Sunday, the young Jemez artist Jaque Fragua would talk Mateo into wearing a T-shirt that said famous indian artist, and it wouldn’t even seem boastful. Two women stopped to browse. Santi slipped into his patter, explaining both the traditional and scientific significance of the symbols on his bowls, which combined conventional lightning and corn motifs with references to the Haber-Bosch process. The women listened with interest, then thanked him and moved on. Santiago seemed unfazed. Patience was key. In case business slowed too much, he’d planned out some costume changes—different outfits, different hairstyles, glasses, no glasses—to keep things fresh around his booth. The weekend was long, and you never knew what might get people interested in your art. But the truth was that, whether or not you were making money and winning prizes, showing up to Indian Market each year was the easy part. All those months in between were where artists’ lives got interesting. 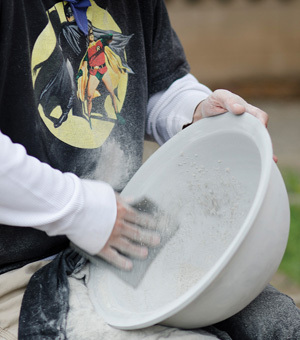 Growing up at Cochiti Pueblo in the early 20th century, Teresita Chavez Romero was taught the traditionally feminine craft of shaping and firing local clay to make cream-colored polychrome vessels. As a young woman, she showed enough talent that her work likely reached Santa Fe, a 40-mile trip east, where the wave of tourists and anthropologists arriving on the railroad transformed Puebloan pottery and crafts from utilitarian goods to hot commodities. An art market was born. Families like the Romeros could head into “town,” as they called the capital, swap pots and trinkets for dry goods, and return to their villages as professional artists. The best were invited back for Indian Fair, which was started in 1922 with a presumptuous mandate to “teach buyers and potters to differentiate good from bad pottery,” former SWAIA director Bruce Bernstein writes in Santa Fe Indian Market: A History of Native Arts and the Marketplace. In addition to her pots, Teresita made the sort of ceramic figures that Cochiti had specialized in during the 19th century. One type at which she excelled, the “Singing Mother,” was a predecessor to Helen Cordero’s storyteller figurines, which in the 1960s would take Indian Market by storm and become indelibly associated with Cochiti art. Teresita’s son, Santiago, was a storyteller himself. Drafted by the Marine Corps, he was wounded in action in Korea and sent to recuperate in the Bay Area, where he fell in love with a UC Berkeley anthropology student. Their two sons, Diego and Mateo, would listen with rapt attention to Santiago’s accounts of Corsairs dogfighting over Guadalcanal, shredding enemy planes to fiery confetti in the night sky. They also picked up his love of art, which he’d studied under Dorothy Dunn, the Santa Fe Indian School teacher who helped found a Pueblo painting tradition by arming her students with watercolors and sending them out to depict village life. In his adult work, Santiago tried to marry the ethnographic Dunn School style to a Japanese woodblock aesthetic, but found his pieces dismissed at Native art competitions as “impure.” The boys, unconcerned with purity, competed to see who could draw better renditions of Marvel comic-book characters. Diego sanding a piece in preparation for Indian Market. 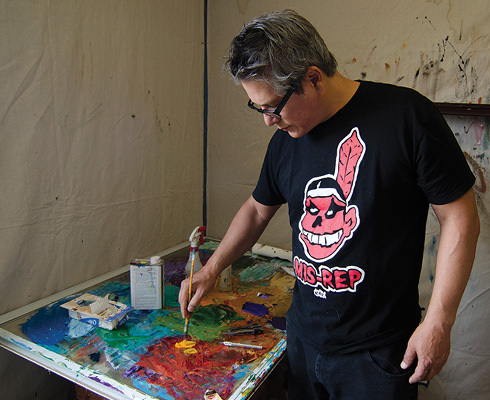 Mateo Romero, pictured at his home studio near Pojoaque, found success at Indian Market with multimedia paintings of Native dancers, such as Deer Dancer with Avanyu. In September of last year, not long after Indian Market, I visited the younger Santiago, Diego’s son, at home on Upper Canyon Road. “Home” in this context was a flexible term; the little adobe house on an unpaved hill was Mateo’s studio. The arrangement recalled Mateo’s own decade as a struggling artist, when he had bounced among family and friends, painting in any garage or kitchen he could. Diego had been particularly generous toward his little brother, letting him share studio space whenever he needed it. Santi’s living requirements were minimal: a mattress on the floor of a room that was really more of a nook, a curtained reading space where an odd assortment of art books commingled with Game of Thrones DVDs. The walls were hung with Oakland Raiders paraphernalia, an affiliation he’d inherited from his dad. Santiago grew up mostly on the other end of California, in Los Angeles, with his mom. Summers were spent with the noted Santa Clara sculptor Roxanne Swentzell, another of Diego’s old flames, whom Santi credits with teaching him to work with his hands. Uncle and nephew worked back to back in the house’s main room, a hollow space lined on one side with Mateo’s paint-spattered surfaces and on the other by a workbench that held Santi’s unfinished clay objects. Crates of vinyl, mostly Mateo’s, were stacked at the back of the room; by agreement, Fleetwood Mac’s Rumours was in heavy rotation on the turntable. Santiago had mounted a collection of stylized longboards on the wall above the coyote bowl he was working on. Those interpersonal relationships become especially important in lean times. After booth fees and miscellaneous expenses, Santiago had more or less broken even at Indian Market. His task for the fall would be to make the rounds with collectors, trying to sell off his remaining inventory before the Santa Fe art market hit its annual doldrums. He’d met many of the people on his shortlist through his uncle. This, more than any point of craft, is the knowledge at the heart of the Romero family business. It has to be. Some families hand down pottery techniques that haven’t changed for generations; the Romeros are imparting ways to survive as an artist. When I next ran into Santiago, at a Santa Fe coffeehouse in November, his harvest had come in. 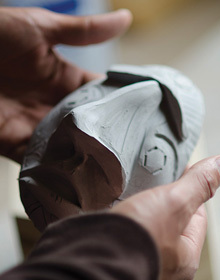 While trying to sell some masks left over from Indian Market, he’d set up a meeting at Buffalo Thunder Resort & Casino, which has what Mateo calls “arguably the most interesting contemporary Native collection anywhere.” Although his buyer didn’t bite, the masks’ Mesoamerican influences struck a chord, and Santi walked away with a considerable commission to create work to decorate the hotel’s new Mexican-themed Iguana Café. The paycheck would help tide him over through the winter. Executing commissions wasn’t quite the same as creating his own art, but it was a good chance to develop his technique. When he moved to Santa Fe after graduating from Dartmouth with a degree in environmental science, Santiago had first looked for museum work before gradually being drawn into creating art himself. “I saw my father across the table, working, and I was like, ‘I can learn from somebody, even if it’s just by osmosis,’” he says. To work on his skills as a ceramist, he spent three years in the studio as a virtual recluse, frequently without a computer or phone. (This was another tactic he learned from his father, who conducts all of his distance communications through Cara in order to better focus on his art.) Sometimes he would go days without talking to anyone at all. Artists’ social lives, not to mention their finances and self-esteem, can be awfully unstable. One bad Indian Market can set off a tailspin of loneliness and doubt. “Winter comes, and you’re here all alone, pacing back and forth, thinking, is this a waste of time? If I don’t make it, what am I going to do? I’ve invested a lot of time and patience and energy into this, building it, and it’s turned against me,” Santiago says. Cara Romero’s fine art photography has won awards at recent competitions. These days, their devotion to supportive relationships comes before anything, even art, though the two typically go hand in hand. While Santiago worked on his Buffalo Thunder commission, Cara was experimenting with the type of elaborate photographic productions that Diego had been encouraging her to try. In collaboration with the Choctaw multimedia artist Marcus Amerman, she dreamed up a rendition of Leonardo’s The Last Supper that would feature well-known friends from around the Indian art world in the poses of the apostles. Amerman himself, wearing an enormous buffalo head, filled in for Jesus. Diego wryly volunteered for the role of Judas. If the August Indian Market in Santa Fe offers a pole by which Native artists can orient their year’s work, the Heard Museum Guild Indian Fair and Market is its spring antipode. In March, Mateo and Cara made the usual trip—what Cara calls the “great migration”—to Phoenix to show their work there. Both had considerable success. For Mateo, this was nothing out of the ordinary; for Cara, it was her best market yet. She submitted The Last Indian Market, her Leonardo-style piece, for judging and won a Best in Division award for photography, marking her fourth straight triumph in a major competition. When I visited Diego and Cara at home in early May, she was still glowing. “I never really thought it was possible to be doing as well at photography as I’m doing right now. It never played out in my head this way. It was always for the love of it,” she said. Diego, who has witnessed this sort of ascent before, beamed proudly. Cara likes to say that the first time she met her husband was “literally in my Native art history class, when we got to contemporary artists”—there he was, in the textbook, a boldface name. Now it was her turn to be invited back to IAIA as a lecturer. She made sure to bring her student work, she said, to offer the class a testament to the learning curve. Diego Romero with a new print at his Santa Fe studio. Diego, too, was making good on an ambition from his student days. On the table in his studio was a print he’d just completed for Landfall Press, a comic-book-style panel of a conquistador named Diego menacing frightened Native women, who took refuge in a church. Though it was inspired by the Pueblo Revolt, he pointed out that the scene could just as easily have been set in classical Rome or 21st-century Iraq. He’d been so pleased with how the print turned out that he was thinking of showing it at the coming Indian Market alongside his pottery. Lately, inspired by conversations with Cara, who’s an active environmentalist, Diego’s pots have started to depict the consequences of climate change. It’s a concern all four Romero artists share. Content—that’s what’s always set them apart: a piece doesn’t have to be technically perfect as long as it has something to say. For her next Indian Market judging piece, Cara was planning to attempt her first underwater shoot. Her idea for it drew on both global warming and the story of her own Chemehuevi ancestral territory, much of which had been destroyed by the creation of a man-made lake. Keeping the long view can be a challenge sometimes. Just surviving from one Indian Market to the next requires a certain amount of what Cara calls keeping your soul on fire—holding on to the inspiration that separates art from cynicism and drudgery. Mateo often talks about painting in romantic terms. “You have to be able to allow yourself to feel like it’s the first kiss all over again. Because people can feel that,” he says. Santiago Romero is making a name for himself with clay pieces like this mask he created in the Santa Fe studio he shares with his father, Diego. One weekend in the spring, I rode with Santiago and Mateo out to the Galisteo Basin to look for some petroglyphs Mateo had read about. We didn’t have much of an idea where we were going, just a crude map on Mateo’s phone and a mention of some basalt ridges where the rock art was supposed to be. We pulled off the highway by some stegosaurus-looking humps and hiked up the hill to try our luck. As we picked our way between rough boulders the color of dried blood, the valley spread below us on either side, bounded on the north by the snow-dusted Sangre de Cristos. It was easy to see why Puebloan people had chosen to live here for centuries—the scenery had the horizontal bands of color and startlingly present clouds that Mateo seeks out for his landscape paintings. We started to spot simple images scraped into the rock: a coyote, a lizard, a grimacing face. After an hour or so, Santi came across a large design nearly covering a smooth vertical surface. It was a shield panel, exactly the sort of drawing Mateo had been hoping to find. A simple human head and limbs jutted from a round body that represented a warrior’s shield. The face of the shield was the piece’s heart: A lightning bolt divided the circular composition, which was crowded on either side with bear claws, human hands, stars, and a figure holding what looked like a mace. The effect was breathtaking. “I’ve not seen better in all my years climbing these hills,” Mateo said. Santiago stared in silence. He was supposed to be back in the studio, finishing up a lizard sculpture for Buffalo Thunder, but he’d been happy to set aside the rote work of smoothing out the piece’s surface for a day of fresh air. Now, eyeing the narrow ledge where an artist must have crouched for hours, without the prospect of recognition or pay, to make the shield panel, he was in awe. “And I complain about sanding,” he muttered. We descended the ridge and kept walking into the desert, picking our way around a desiccated coyote carcass. Songbirds chirruped in the flowering cholla. Beetles crawled over cow patties, though the cattle themselves had long since moved on, leaving half-consumed salt licks in the dust. Somewhere up ahead of us lay the ruins of an old Pueblo, hidden in the folds of the hills, where we were sure to find spectacular art. All we had to do was not turn back. John Muller is a writer in residence at El Zaguán in Santa Fe.